Hey … that’s just about everyone I know. 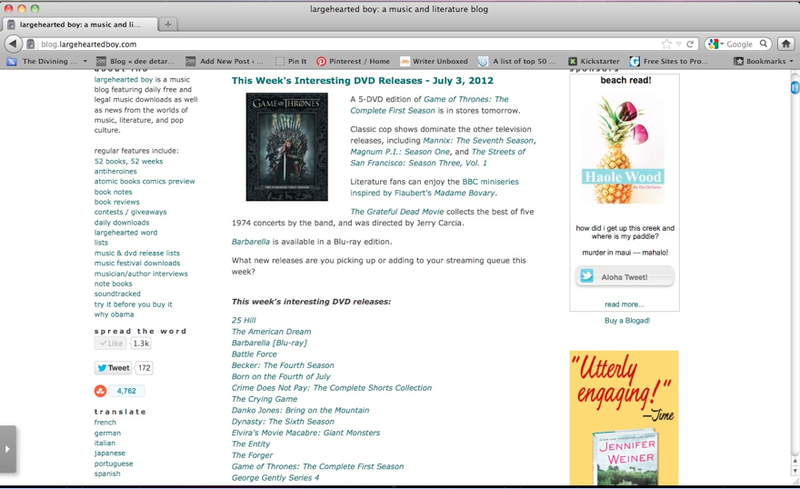 She mentioned her ads that were posted on literary websites, which is where I met Largehearted Boy. Hearkening back to my old marketing professor’s three rules of advertising—KISS, hunt where the ducks are, and circulate to percolate (I told you he was old)—I pushed the go button. I acted Now! For a limited time only! and paid people ($200 for the first week of July) to pay attention to me, as I hoped and prayed my new book would take off. I published Haole Wood on May 15. For the month of June, I sold 87 copies, with 15 borrows. I also offered it FREE from June 7-11 (by being part of KDP Select) to the tune of 5,301 downloads. For the first two weeks of July: 32 sales, 14 borrows. My one-week run got 18,312 impressions, 22 clicks and five tweets. I’m pretty sure I was three of those tweets. Would I do it again? Advertising is way more fun than abusing Facebook and Twitter (Holla! @Porter_Anderson!). There’s just that pe$ky little $ituation that sent me back to the drawing board. 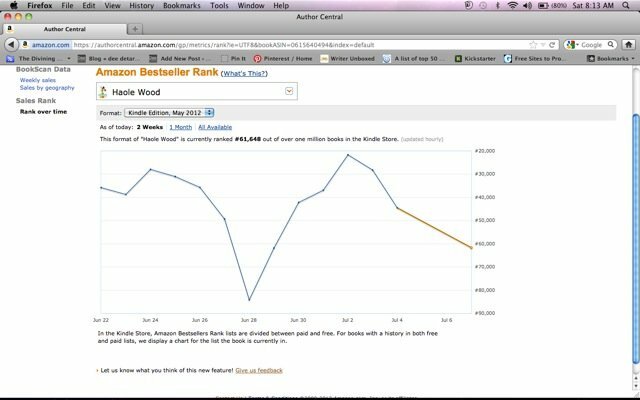 I don’t have any idea why the book tanked on this chart on June 28. Was Mercury in Retrograde again? At risk of going all Gladys Kravitz on “real” authors, Dee DeTarsio is a writer living in southern California. Thanks, Holly! That’s just it–we don’t know if our efforts will even be noticed, and if they are, how they will be perceived! Best of luck to you with your new novel! Hi, grats to success! How was the $200 spent? To help clarify for Dee, it was spent on that single ad you see in the screenshot above. Thanks, Selena, and congratulations on your success! I think you have the right secret of building name recognition with a combination of tools! Darn those $tumble-point$ that sent you $crambling! Although I never feel like you’re abusing fb and Twitter, Dee. Not like some, who are sure to go blind if they keep it up. Thanks for sharing! Great post Dee. I’m a long ways off from finishing my book but have been researching the marketing side along the way. Very daunting. I’m starting to think that writing a book is a lot easier than selling one. Thanks for your comment, Jacklyn! You are so right–writing is soooo much easier than selling! Good luck on your book! Timely post, I was just looking at some advertising things yesterday. I’m not massively sold on the idea of advertising for books, but feel certain types (like a day or two on Kindle Nation) might be worth the money. I feel it all has to be done in one go though, so your book can shoot up the charts. If it gets high enough, you might be able to stay there. Thanks, Matthew–Turndog Millionaire! I agree with you on maximum presence in one go-through, and I just tried that with KDP by using all 5 free days in a row to try and reach (and sustain) a more visible position. I’m going to try it again next month and see how it goes. (I also have heard Kindle Nation is a good idea!) Good luck, thanks for your comment!